tants for all tuning and racing problems. A roofline lowered three inches, together with a shallower windscreen and more steeply raked rear window, give the car a new, sporting look. There is still headroom for six-footers - special seats place driver and passengers closer to the floor, and give improved support for fast motoring. Above all, the Emery GTI is not expensive. The complete conversion of a standard Imp or Chamois costs £ 130. A wide range of tuning equipment for even greater performance is available from Paul Emery Cras Ltd., which make the GTI a potential race-winner as well as an ultra-fast grand touring car. For competition use, special 850, 1000 or 1150 cc. engines may be specified. In 1964 Paul Emery Cars prepared and tuned Imps to all shapes and sizes for road and competiton use, as well as marketing the GTI as a sort-of complete car. 65 mm for the 1,150 cc engines. stroking the crank where necessary. To produce a car to GTI specifications also involves lowering the roof-line by four inches, chopping metal out of pillars to achieve it. The seats are lowered to make more headroom. The headlining is hung on to, for economic reasons. The front windscreen has three inches chopped off. (So an inch less than the total lowering job.) The rear window is retained, at an increased rake. The front pivots are dropped on the swing-axle front end. New shock dampers: adjustable ones, either Koni or Armstrongs. The steering geometry is altered to accommodate the drop in the suspension geometry. An anti-roll bar is fitted -to the front only- to eliminate, or at least reduce, the possibility of lifting inside back wheel. 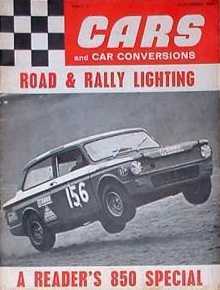 By late August 1965 testing had started on a prototype self locking differential. Should this be fitted, then an anti-roll bar could be fitted at the rear end, too. This prototype diff was made by Jack Knight, who did a series of close ratio gears for the Emery Imps. There was a range of manifolds, carburettor set-ups, camshafts and so forth that was married up with any of the five capacities, decided by the customer's choice of engine tune. Tuning takes three forms, of which the first one is the choice in capacity. The 850 cc engine could be made to produce about 74 bhp, the 998 about 85 bhp. No exact figures were given for the 1,150cc engine, as it hadn't been given sufficient run. Carburation: either SU's, Strombergs or Webers. The Stromberg CD pattern instrument was new at the time. Paul Emery regarded Webers as mainly a competition choice, because of the difficulty of installing them satisfactorily in the Imp engine bay. For a more docile road Imp he would use SU or Stromberg. He prefered Strombergs, saying they are slightly better and easier to tune - a smaller range of needles anyway. Emery Cars was also testing a fuel injection system, looking for a better solution than the other three. By mid-August fuel injection was still a long way off. Closer by was a transistor ignition system, based on a system produced by Klinger Controls Ltd. Willy Griffiths was doing the testing. He expected improved sparking over 6000 revs. Especially for the Emery engines that run at over 9000 revs, this would be a benefit. Stage 4 - Weber carburettors with a combined inlet/exhaust manifold. On the exhaust side Emery Cars have developed a system of longer pipes to keep the silencer further away from the exhaust valves, which can otherwise cause a pretty short silencer life. a proper racing head with big valves and ports and an 11.5 to 1 compression ratio. 2 Aspenlea Road, Fulham, London, W.6. The new EMERY GTI - a sleek and elegant 2 + 2 coupé based on the Hillman Imp body shell - makes its debut at the 1965 Racing Car Show. A roofline lowered six inches, coupled with a shallower windscreen and more steeply raked rear window, turn the Imp into a most elegant sports saloon. Headroom is not sacrificed; special seats place the driver and passengers closer to the floor, and provide better support for fast motoring. Many items of interior trim are to the owner's choice, and a very wide range of engine and suspension options, in addition to luxury interior fittings, are available. Above all, the EMERY GTI is not expensive. A converted Imp saloon costs only £660 (provisional) for which the owner receives special seats and runners, Triplex windscreen, lowered steering wheel, and a distinctive contrasting paint stripe on the side of the car, in addition to the new silhouette. The EMERY GTI will undoubtedly be welcomed by Imp and Chamois owners who want something different. Competition enthusiasts, however, will note the potentialities of the lowered centre of gravity, reduced weight, and greatly improved aerodynamics of the converted car. A special version will be raced by the works in 1965, and further competition models are already on order. Photographs of the GTI will be featured on the Stand, and demonstration models will be available throughout the Show. Tuning equipment for the Imp, developed in the course of a season's racing with the outstandingly successful EMERY GT, will also be on display. An Imp engine enlarged to 998 c.c. forms the centrepiece of the stand. Other equipment ranges from modestly priced conversions suitable for fast road use, either on a standard Imp or Chamois or the new EMERY GTI, to special racing components. Weight can be reduced with glass fibre panels, and front and rear anti-roll bars aid handling. Weight distribution can be improved by a front-mounted radiator. Modified, gas flowed cylinder heads with compression ratios up to 11.5 : 1, dual S.U. and dual twin-choke Weber carburettor assemblies, and special camshafts, manifolds, valves, springs and pistons are exhibited. For full-blooded racing, engines can be enlarged to 1,148 c.c. as well as 998 c.c. These are the conversions which enabled the Emery GT, which continues to. be available to speCial order, to break class records at Brands Hatch Snetterton, and Brighton Sprint. The chopped Imp (Chimp?) comes from Paul Emery Cars Ltd., of Aspenlea Road, London W.6, who claim 90 m.p.h. from this tuned Imp with the low roof-line. The roof-line is lowered three inches in fact. Special lower-built seats retain the the original headroom. The lower centre of gravity is said to improve handling compared with the standard Imp. Engine tuning for the road is limited to the fitting of twin carburetters and improved inlet and exhaust manifolding. The price of the complete car is £700 tax paid. Paul Emery is planning to race one next seasoo. Lowering an Imp's roof line is a very difficult operation. David carried out the job himself, but recommends anyone wanting their Imp lowered to consult someone like Paul Emery. 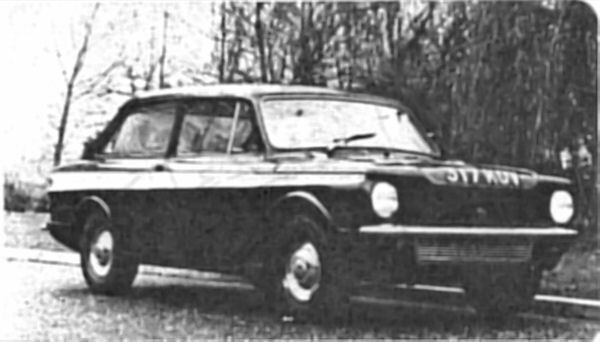 Paul used to market the Emery Imp, which had a lowered roof line. This car was his answer to the Minisprint. The most difficult part of lowering an Imp's roof are the modifications that have to be done to the rear pillars. If you want to lower the roof 1 in., then you must take away a triangular piece of metal from both rear pillars on the leading edge. For 1 in., this must be 1 in. wide and cut into the pillar to a depth of 5 in. The maximum lowering of an Imp that Emery advises is 2½ in. Once the back pillars are modified, cut through the front pillars in their centres. Cut out the amount you have decided to lower the car by. Then make a single saw cut through the centre pillars. Jack the roof forwards, pressing down on the roof at the same time. Use a body repairer's jack to push the roof forwards and get someone to put their weight on to the roof. Maintain the pressure until the front pillars meet. Spot weld the front pillars before cutting out slices from the centre ones. The roof at this stage is structurally finished. You also have to lower the doors. The top surround has to be modified. Remove this by chiselling away the surround securing spot welds. Lower the surrounds to the correct amount and reweld. Although you can use standard glass again for the doors, you will need new quarter lights, rear side windows and screen.